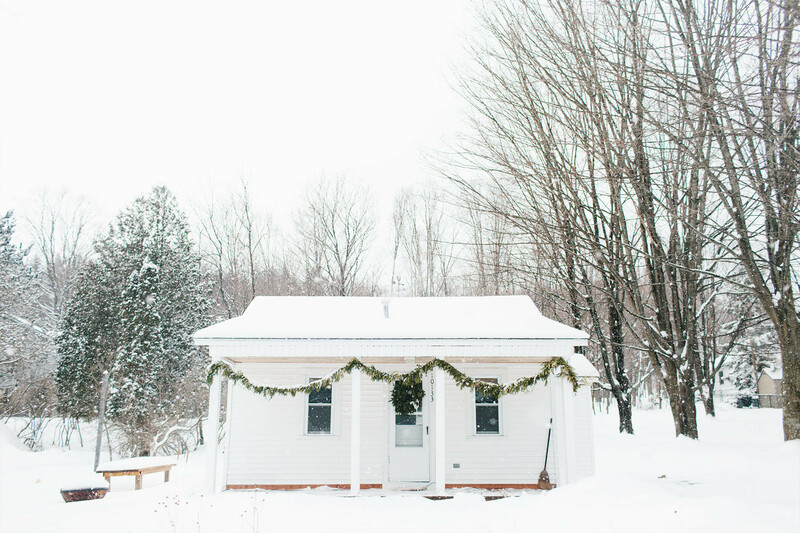 Michigan-based Mae Stier keeps the festive vibe alive throughout the month of March — "it's a bit strange, I know," says the photographer — with decorative greenery and a foraged wreath. Photographed by Mae Stier for Lonny. It takes guts to make the move from Brooklyn to small-town Michigan. 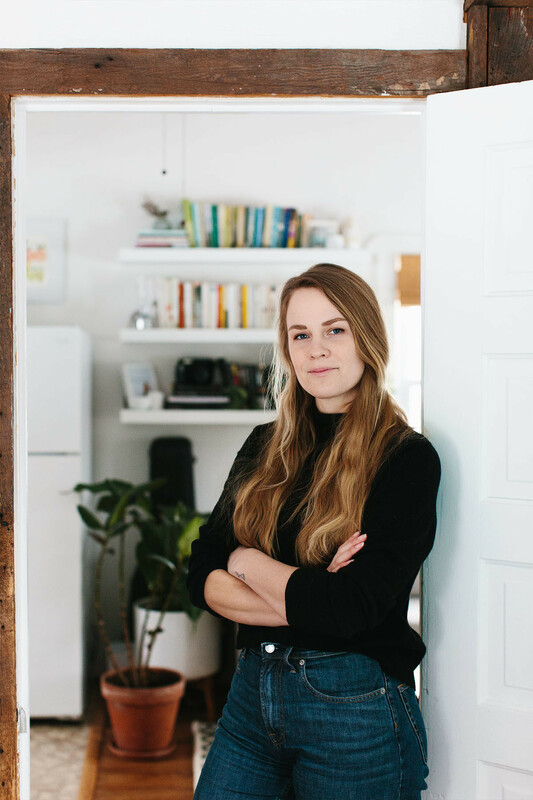 In the winter of 2016, this is precisely what a then 28-year-old creative Mae Stier, decided it was time to do. "I grew up on a couple of acres in the country that bordered a field, woods, and wetlands," Stier explains. "My brothers and I spent all of our free time outside exploring, building forts, and riding our bikes." Dotted on a stark, snowy landscape in a small town named Empire is where you'll find Stier, these days — the town's population sits at around 375 — depending on the season. A little over two years ago, the photographer, writer, and content creator swapped the coffee shops and chic cocktail bars of Brooklyn for the hiking boots and bone-cold winters of Northern Michigan and hasn't really looked back since. Built in the 1930s, Stier's little white cottage arrived in its current location sometime around the mid '50s, occupying an otherwise empty clearing. 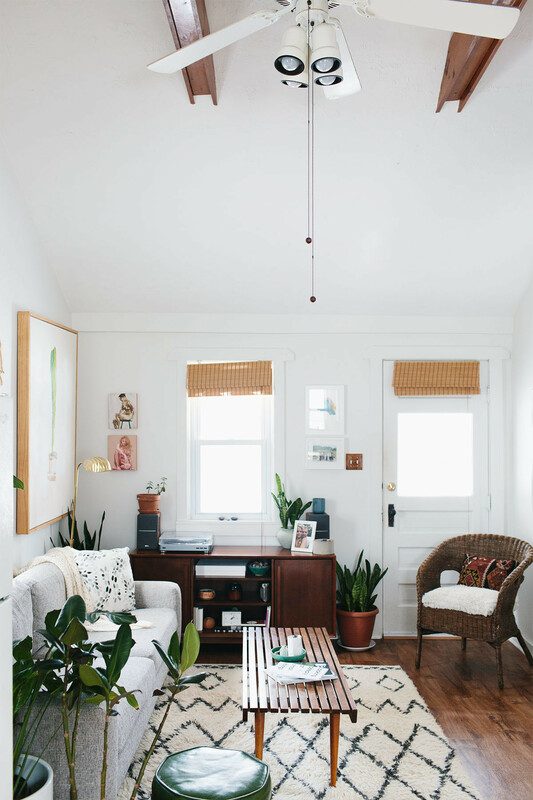 It's humble, by all means — a mere 500-square-feet that serves equal parts form and function. Stier adores her home, decorating the space with an eclectic mix of fast finds and family heirlooms, sourcing her cozy Eddy Sofa from West Elm and crisp white winter bedding from Amazon. The photographer's space is peppered with vintage treasures, many sourced during treasure hunts at her favorite local vintage store, Wilson Antiques, or passed down from family members. "A usual day off consists of coffee and writing in the morning, just like any other day, and maybe a walk down to the beach followed by brunch at Joe's Friendly Tavern. After that, I may read for a while." The cottage, with all its quirks and character, achieves what few can ever really master — space. Every nook, shelf, mezzanine, and hobble, serves its purpose. 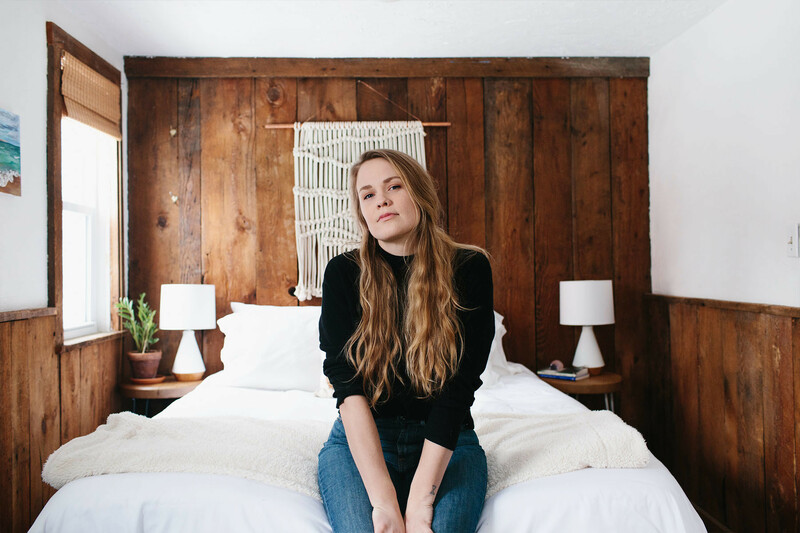 "It was New Year's Eve 2016 — a few days after saying out loud that I wanted to move to a rural village in Northern Michigan," Stier says, when asked how she discovered her unique space. "I stumbled across a 'For Rent' sign in the local grocery store, and immediately knew that this was my home." Inside, you're compelled to curl up into a ball, peel a book off the shelf, or thumb through Stier's growing vinyl record collection — showcasing everyone from Kendrick Lamar to Johnny Cash. Sit and watch as the day ticks away, the snow starts to melt, or the darkness begins to swallow her little home whole. Stier's not completely off-grid, though — Traverse City is about 22 miles due east of her home town — yet the surreal, secluded cottage certainly feels about million miles away. Stier admits the key surviving a bitterly cold winter involves house plants, good books and plenty of natural light. West Elm Sofa | Allie Kushnir Pillow | Wilson Antiques Coffee Table | West Elm Rug | Laura Hobson Artwork | Katherine Cordon Artwork | Audio Technica Record Player | Debbie Carlos Artwork | Vintage Lamp; Throw; Armchair | Darling Botanical Co. Plants. "A love of nature is what drew me to the village I live in now, it's nestled within a National Lakeshore," Stier explains. "I had lived in cities for about a decade, prior to moving to Empire. I'd been living in Brooklyn — change of pace, right? — but I grew up in a small town in downstate Michigan, so there is a familiarity to living in a rural village," she adds. "I am fairly far removed from urban areas now — the closest metropolitan area, Grand Rapids, is over two hours away, but we do have a lovely small city nearby (Traverse City), that offers great food, art, and culture." Stier's lifestyle doesn't call for the conventional tenant's checklist, not when it comes to finding a place to call home, anyway. There's no lengthy commute to work, she works remotely. There's a refreshing, alternative appeal to Stier's world, a space she's carved out for herself with an attention to detail that's nothing short of admirable. Tiny spaces are given multiple functions in Stier's unique 1930s home. Laura Hobson Artwork | Vintage Counter; Stools; Candlesticks | (upstairs) Vintage Throw | Target Lamp. "I lived in cities for most of my 20s, and definitely had some hesitations with moving to a small town," she says. "I was 28 when I moved to Empire, working as a freelancer, newly single, and worried that moving to Northern Michigan would make finding work difficult and that I would be alone, forever — dramatic, I know. But then I realized that not moving would mean allowing my fear to keep me from where I felt I needed to be, so I said damn it, and moved here — I haven't missed living in big cities, at all." Try as you might, but located in the snowy landscape of Northern Michigan, you'll hear no muffled street sounds, no car horns, no back and forth between friends, or the tail-end of a passing conversation — there's a purity in the air that you just don't find in the city. "When I moved, I did so because I would rather be able to walk to Lake Michigan than to a trendy coffee shop. "It's been such a wonderful move for me, though I wouldn't be opposed to a cute little coffee shop coming to our town," she laughs. "I have met a lot of other young creatives who live here, and we agree that it takes work to find a like-minded community, in rural areas. But then again, it takes work no matter where you are, to find a community you can click with." 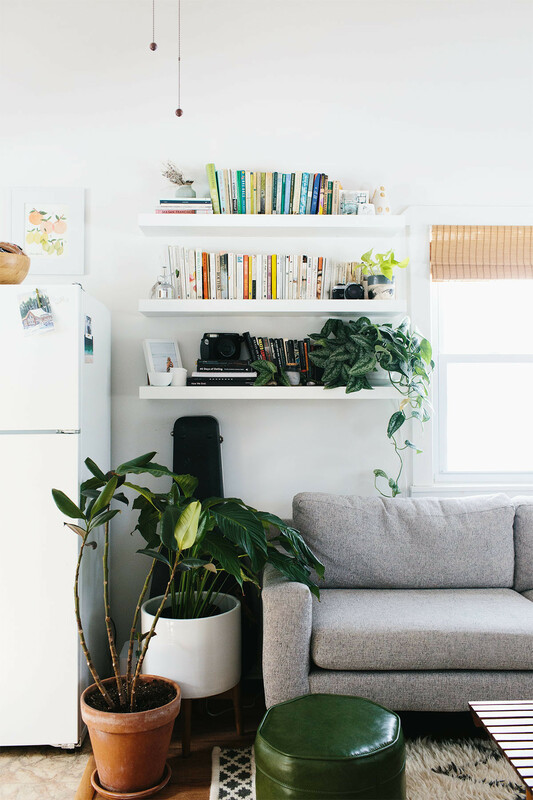 Stier added IKEA shelves and filled her tiny cottage with house plants, to give her home a cozy, restorative vibe. IKEA Shelves | West Elm Sofa | Vintage Ottoman | Wilson Antiques Coffee Table | West Elm Rug | Darling Botanical Co. Plants. | Vintage Accent Pieces. Despite the cozy space she's created for herself indoors, Stier feels most at home in the great outdoors. "I recently started a hiking club that meets every Sunday, it's been a great way for young people to meet each other," Stier says. "I love that although there is a smaller concentration of young people in our county — the median age is close to 60 in Leelanau — it's easy to find connection with almost everyone you meet, over a shared love of the land." Bedside Tables | Target Lamps | Darling Botanical Co. Potted Plant. Mother Nature, in all her majesty, certainly doesn't disappoint. Surrounded by the raw, uninhabited landscape, Stier's home must remain fully equipped for whatever the seasons bring. She celebrates the flora and fauna in spring, and remains on her toes for the bitter cold during Michigan's winter. 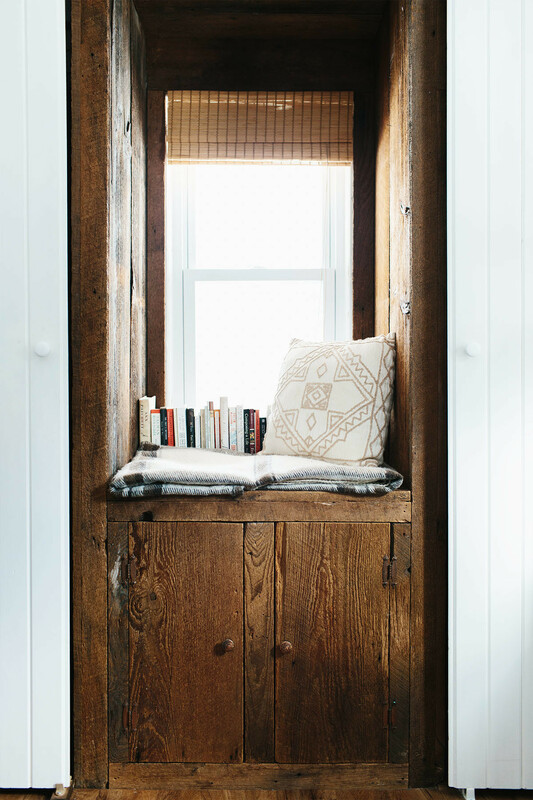 To comfortably work from home, Stier created a cozy study nook within her cottage. West Elm Desk | CB2 Side Table | Darling Botanicals Co. Plant | Spencer Arthur McQueen Artwork | Target Rug | Apple Mac Computer | IKEA Lamp. "In all honesty, I really love winter and have loved it so much more since moving to a place where winter is all-encompassing," Stier admits. "The whole world seems to slow down with the season, and there's almost nothing better than waking up to a fresh snowfall in the morning. But after months of cold, heavy snow, and a sad lack of sunshine — it can be a bit draining. The best remedies (besides escaping it for a few days), are to dress for the weather, get outside and get in it. Engaging with winter is the best way to make it through it." During spring's first bloom, when her own boundless backyard is blanketed in wild flowers, Stier plays host to her friends, throwing dinner parties that roll into roaring campfires. "The most significant changes I've made are to the outdoor space," Stier says. "My dad built me the farm table, and I set up lights and turned my outdoor space into the perfect location to entertain. I didn't make many changes to the framework of the interior, I just added IKEA shelves, my furniture, and lots of green plants. "My dad built me the farm table in my backyard," explains Stier. "This winter, I hosted a few holiday parties, including a winter solstice, that was my favorite," Stier explains. "Friends came over, bundled in winter coats, and we hung out by the fire for hours. 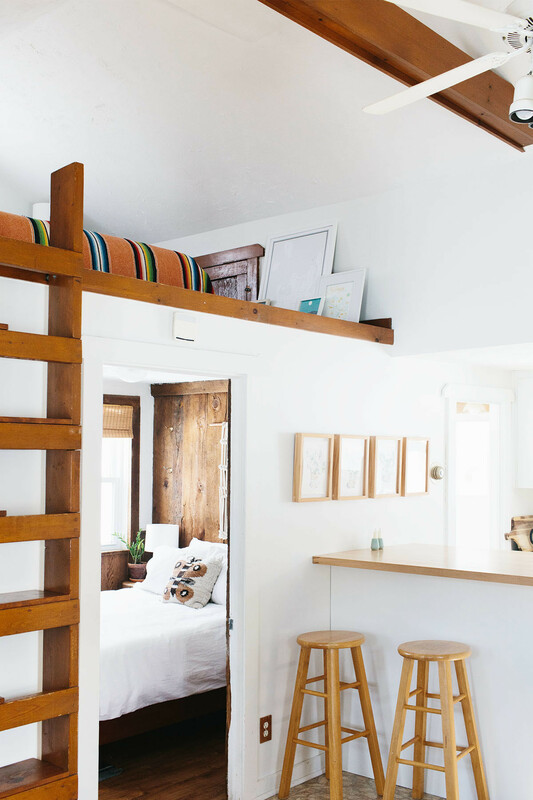 I also love to host friends that come stay with me, I'm grateful that my small space has a little mezzanine bedroom for them to stay in." 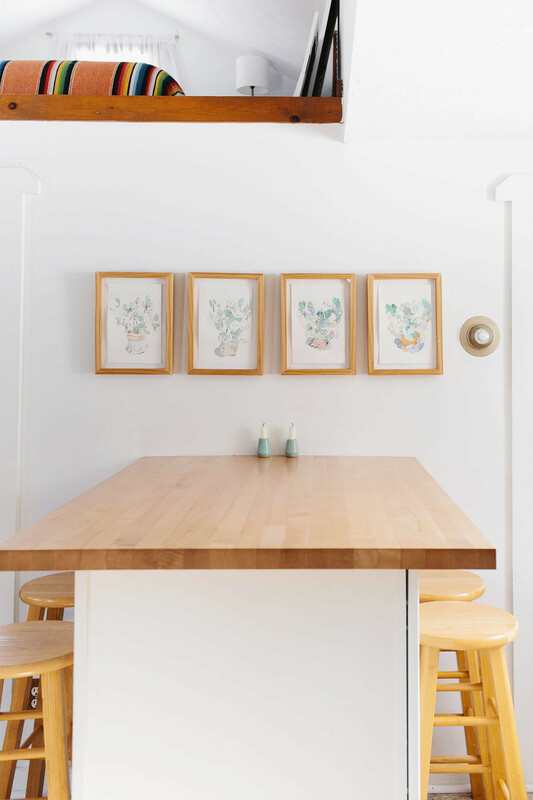 Stier's upper loft level, positioned directly above her kitchen counter, serves as a cleverly organized little space, with a welcome pop of color, thanks to an orange, '70s style throw and assorted leaning artworks. "I love the tall ceilings in the living room and in the loft bedroom. It gives my home such a unique feel, and makes the space feel a lot bigger than it actually is." Stier admits her home boasts an even split of main street finds and antique treasures, however she's starting to lean toward more pre-loved pieces. A mezzanine level bedroom sits directly above Stier's own bedroom space. Laura Hobson Artwork Series | Vintage Stools | Zinus Platform Bed | Amazon Bedding. 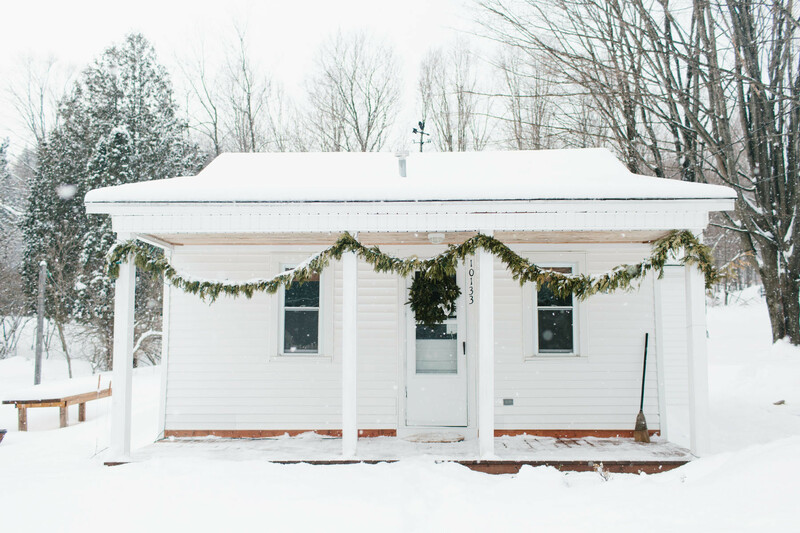 Stier describes her cottage style as "cozy and ecclectic." 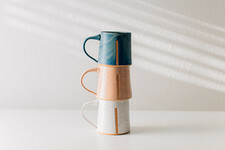 "Well, I love West Elm, but I also love wandering antique stores — and there are so many good ones in Northern Michigan. 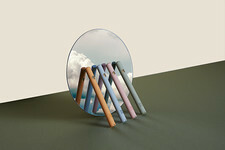 Sometimes, I like to go new, just so that I can get exactly what I'm envisioning. Although, my favorite piece of furniture is the vintage gold lamp, next to my sofa. It was my grandmother's, she passed away last summer. I have memories of this particular lamp, standing by her and my grandpa's bed, when I was a little kid. I turn it on every morning when I sit down to write, it's a reminder of her presence." 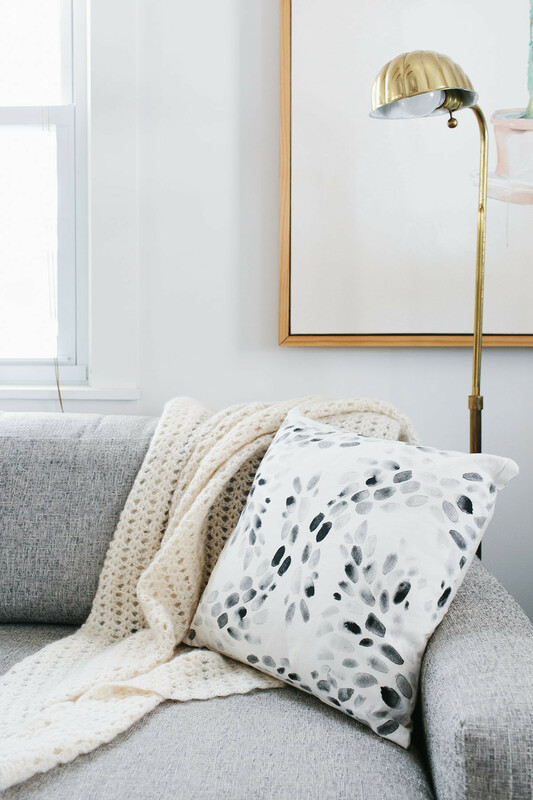 West Elm Sofa | Vintage Throw | Allie Kushnir Pillow | Vintage Lamp | Laura Hobson Artwork. Stier's wintry retreat may feel far from civilization, but two years on, and there's still no sign of cabin fever. "My home has greatly impacted my work-life balance, and has even encouraged a shift in the type of work I do," the 30-year-old admits. 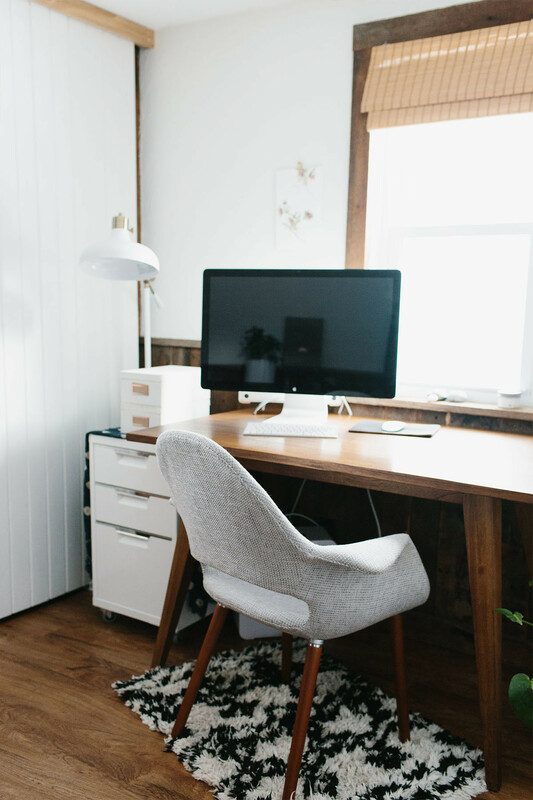 "I do a lot of my work from home, now, and love having a few different spaces within the cottage to work from. I typically begin my day with a cup of coffee, preferably on the couch, reading poetry or essays, and writing in my notebook. I love living within walking distance to Lake Michigan, because I can take a break around midday, walk to the Lake, and regain inspiration — as needed."